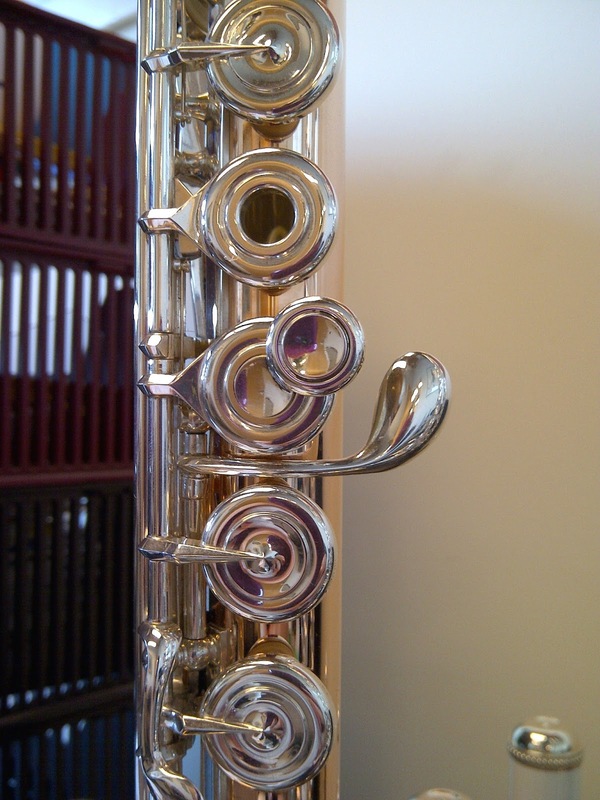 We've heard from many flute players over the years who have developed arthritis or other health issues with their hands and wrists. Some players have even suffered injuries or have had surgery. In these cases of hand and wrist issues, many have asked for key extensions. 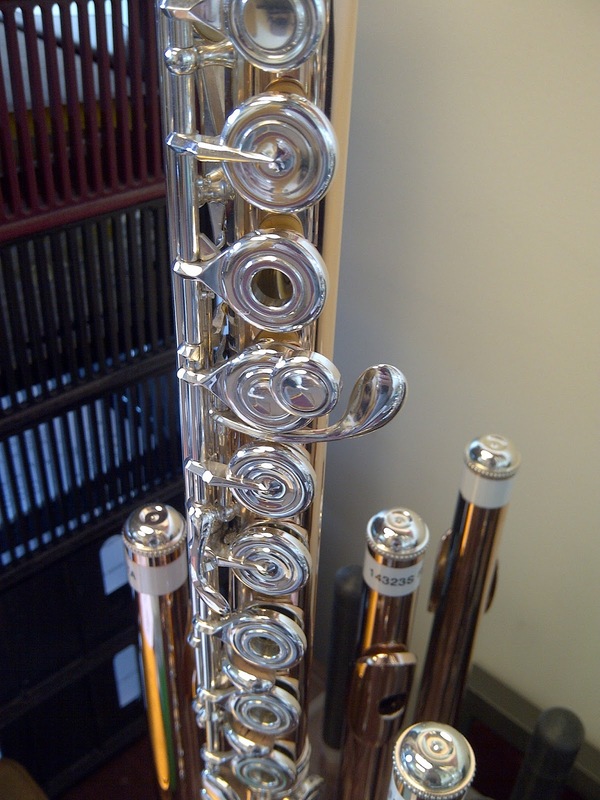 After stopping in the repair shop this week, we discovered that one woman will be getting her Powell flute back with a very special key extension. A woman who recently had wrist surgery called our repair shop and spoke with our technician, Rachel Baker. She requested to have a key extension for her G key. 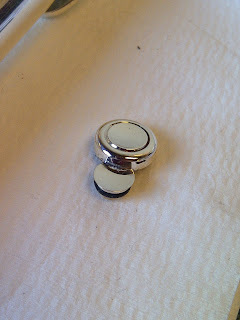 Rachel came up with a new idea for a key extension that was actually quite simple -- a C1 key cup soldered to a Plug-O! When we first saw the extension, we couldn't tell from the outside that it was removable -- but, indeed it is! Like a regular Plug-O, you can insert it and remove it. Rachel Baker pointed out that it is removable and "movable." You can rotate it and position it exactly where you want it. 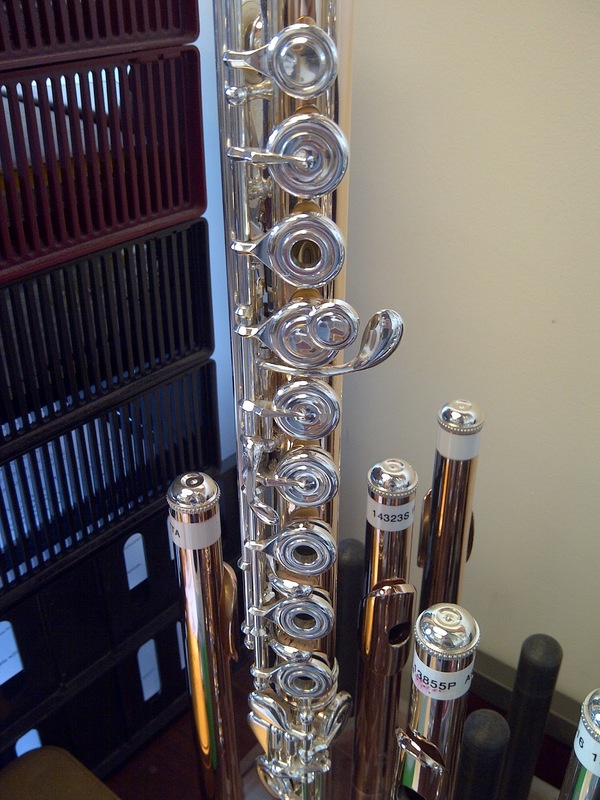 It is also transferable, so if you get a new Powell flute, you can use it with that one as well. Also, because the extension is removable, it does not permanently alter the original mechanism on your flute. 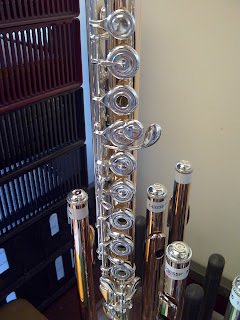 This is helpful if you decide to eventually sell your flute. 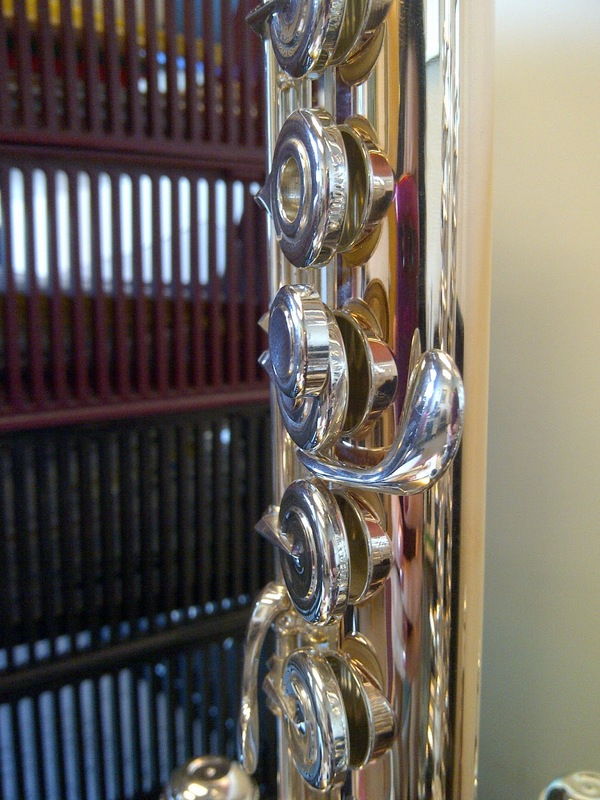 Finally, Rachel adds, "and it's solid silver," which is certainly a terrific perk! Rachel mentioned to us that many people can benefit from this key extension. 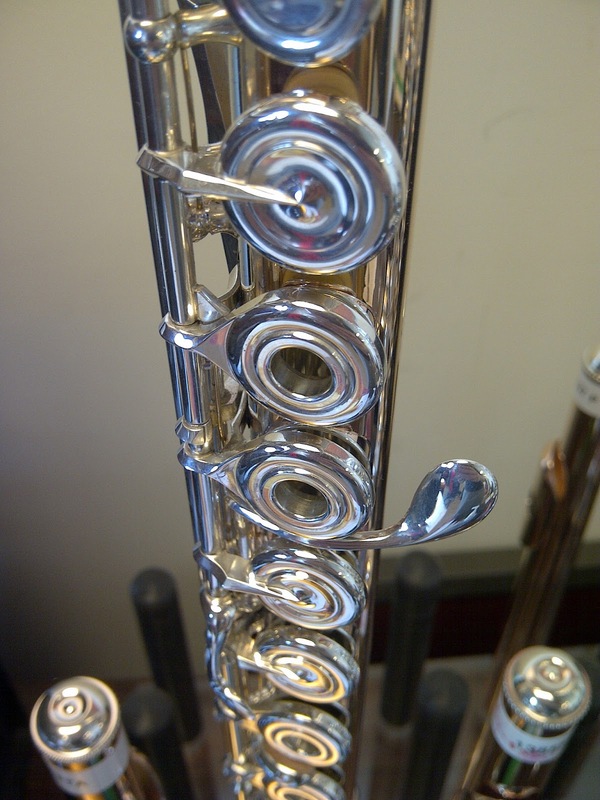 Aside from those with hand and wrist problems, we know that not all flutes players are alike. 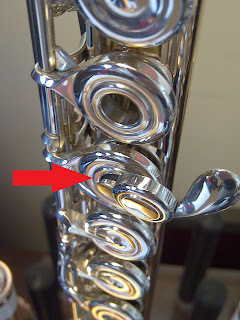 Some players may have difficulty with comfortable hand position on an inline flute if their hands are too big or too small. 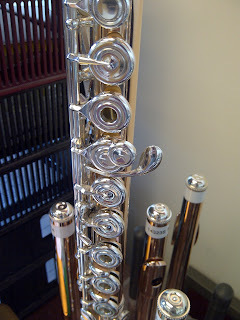 The Plug-O key extension functions in a way that helps "mimic" an offset style on an inline flute. Before soldering, Rachel positioned the key cup onto the Plug-O where she felt it was the most comfortable. However, it certainly is possible to position it differently to meet the player's preference. If you are interested in an extension for your G key (or any other keys), feel free to contact our repair shop after May 13th, 2013 at (978) 344-5164. 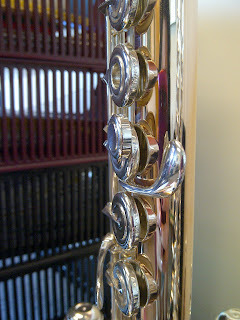 Key extension is made from a Plug-O with soldered C1 key cup. 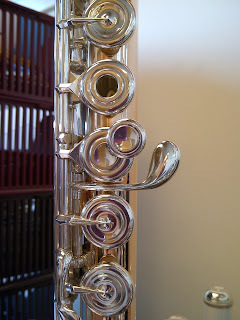 Front view of Plug-O key extension. Removing the key extension is as simple as removing a Plug-O! It's out, and there is no change to the G key.